Rey Lugtu is a digital transformation thought & action leader, a sought-after public speaker and trainer, and an accomplished educator and business columnist. 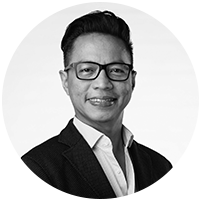 He is the President of Hungry Workhorse, a digital and culture transformation consultancy firm; and Co-Founder and Counselor of Caucus Inc, a data privacy and business advisory firm. He has engaged with several companies and organizations on digital transformation and innovation, helping them in strategy and execution. He is also the chairman, independent director, co-founder, and adviser of several startup and tech companies. He previously held senior executive roles in Microsoft, Samsung, Globe Telecom, Emerson, and IBM. He is the Chairman of ICT Committee of the Financial Executives Institute of the Philippines (FINEX), Vice Chairman of ICT Committee of the Management Association of the Philippines (MAP), Chairman for SME Development of Foundation of Filipino Entrepreneurs Inc (FFEI), Board of Trustee of the Foundation of Outstanding Mapuans Inc (FOMI), Board Adviser of the Global Chamber Manila, and Executive Board Adviser of the FEU Innovation Center. He is Professorial Lecturer in the MBA program of De La Salle University, where he has been teaching for 15 years; and was Adjunct Faculty of Asian Institute of Management where he taught Digital Transformation. He is a business columnist and writer for Manila Times, Manila Bulletin, and Business World. He earned his MBA from DLSU where he is also finishing his doctorate. He finished courses in business from INSEAD-Wharton University of Pennsylvania, China Europe International Business School, and Helsinki School of Economics.